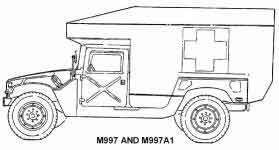 The M997, M997A1, and M997A2 are 4-litter ambulances (Maxi-Ambulances) with armor protection and air conditioning for crew and patients. The M997A2 models have new bumpers, which make the vehicles slightly longer. 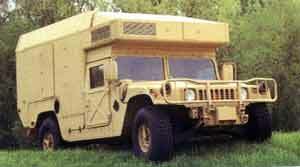 A 9,000 lb winch is also available for the M997A2 models as an option. The M997, M997A1, and M997A2 ambulances are capable of transporting up to four litter patients, eight ambulatory patients, or a combination of litter and ambulatory patients. Additionally, medical personnel, equipment, and a driver can be accommodated in the vehicle. The ambulance can be heated, ventilated, or air conditioned, depending on environmental conditions. For operation in an NBC environment, the M997, M997A1, and M997A2 are equipped with a Gas- Particulate Filter Unit (GPFU) with heaters capable of supporting up to seven personnel equipped with either M25 series protective masks or M13 series patient protective masks. The GPFU forces temperature-controlled, filtered air to the mask facepieces, which increases protection, eases breathing, and reduces stress and heat fatigue during extended periods of NBC operation. 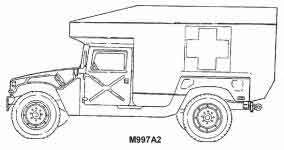 Fully-loaded M996, M996A1, M997, M997A1, and M997A2 ambulances will climb road grades as steep as 60% (31°) and traverse a side slope of up to 40% (220). The vehicles ford hard bottom water crossings up to 30 inches (76 centimeters) without a deep water fording kit and 60 inches (152 centimeters) with the kit. The M997A1 models have the latest modifications applied to the vehicles.